CLEVELAND, OH--(Marketwired - September 27, 2016) - Not all art galleries are created equal, and Gallery W is certainly not like most art galleries. Located on the ground floor of the newly constructed American Greetings Creative Studios world headquarters at Crocker Park in Westlake, Ohio, Gallery W marks the first time in the Company's 110-year history that a space at the headquarters will be open to the public. The public is also welcome at the grand opening reception on Thursday, September 29 from 5:00 p.m. to 9:00 p.m., which will feature the 37th Annual American Greetings Fine Art Show as the inaugural exhibit. The 4,800 square-foot gallery is a unique extension of American Greetings creative and innovative culture and is one more way the Company is working to make the world a more thoughtful and caring place. The diverse range of upcoming shows and mediums will include a combination of pieces that are for-sale and not for-sale. This directly supports the Gallery W mission to foster and build relationships with our community through curating and publicly exhibiting diverse and inclusive works of art that may inspire, educate and entertain. Aside from the Fine Art Show, the work displayed in Gallery W will not be from American Greetings creatives, but rather from artists local to the Company's home state of Ohio. 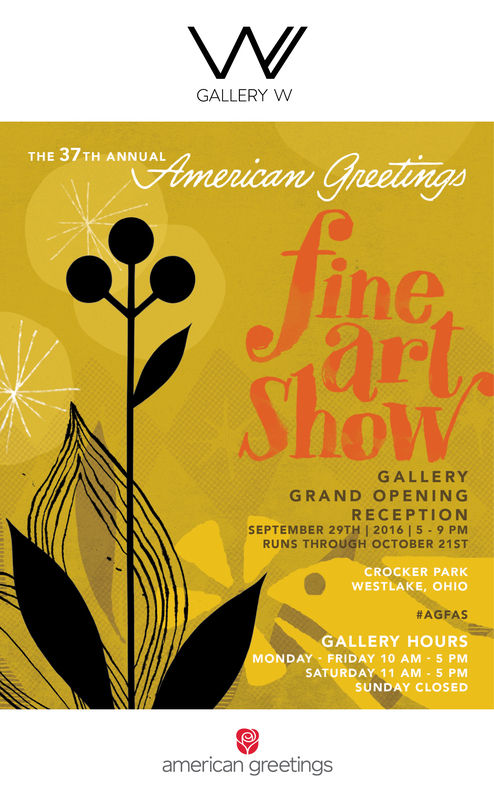 The Fine Art Show is a juried exhibition of the personal works of American Greetings associates and will be on display through Friday, October 21. This annual show offers an opportunity to recognize the individual inspiration and creative mastery of American Greetings professionals. Possibly the most-exciting item to note about the Fine Art Show is that associates from every department are welcome to submit work, and it's not uncommon for exhibitors and winners to be associates who do not work in the Creative Department. "The spectrum of shows and unique forum at the American Greetings Creative Studios will appeal to a broad audience, and we are looking forward to welcoming everyone to this special space," said Linda Marshall, Digital Creative Director at American Greetings and Manager of Gallery W. "Gallery W is a real gem for Cleveland because our mission is broader than most galleries, which affords us the opportunity to bring the community a wide variety of art expression and to partner with other organizations to show-off the talent and resources throughout Ohio." Please visit the Gallery W website for the hours the gallery is open, information about upcoming shows and more. As a leader in meaningful connections, American Greetings Corporation is a creator and manufacturer of innovative social expression products that assist consumers in making the world a more thoughtful and caring place. Founded in 1906, the Company's major greeting card lines are American Greetings, Carlton Cards, Gibson, Recycled Paper Greetings and Papyrus, and other paper product offerings include DesignWare party goods and American Greetings and Plus Mark gift-wrap and boxed cards. American Greetings also has one of the largest collections of greetings on the Web, including greeting cards available at Cardstore.com and electronic greeting cards available at AmericanGreetings.com. In addition to its product lines, American Greetings also creates and licenses popular character brands through the American Greetings Entertainment group. Headquartered in Cleveland, Ohio, American Greetings generates annual revenue of approximately $1.9 billion, and its products can be found in retail outlets worldwide. For more information on the Company, visit www.corporate.americangreetings.com.